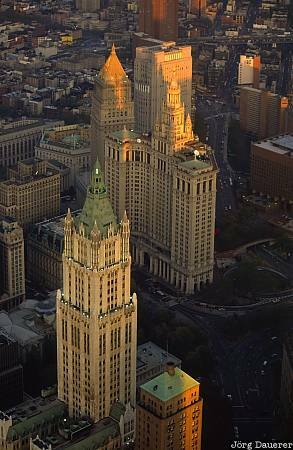 Woolworth Building and City Hall in the background seen from the top of World Trade Center in downtown Manhattan at the blue hour just after sunset. Manhattan is in New York City, New York in the east of the United States. This photo was taken after sunset on a sunny day in September of 1995.